Fiberglass has been available for the last 20 years, but it has not been popular or familiar among many building contractors as a framing material for windows. For sure, fiberglass windows are made available mostly from innovative window manufacturing companies and is now offered by nearly all the large North American window brands. Most fiberglass used in windows are of the pultruded variety that distinguishes them from lower strength fiberglass used in other applications like swimming pools. Poltrusion is a process that put in more glass content in the compound using continuous glass strands saturated in the resin substance. As a result fiberglass frames exhibits excellent properties that match the 70% glass in windows. It has superb dimensional stability that gives it similar rate of expansion and contraction as glass (1/7th the rate of vinyl and 1/3rd the rate of aluminum). This means less torsional stress between the fiberglass frame and the glass during winter, reduced air leaks and stress on locking hardware. 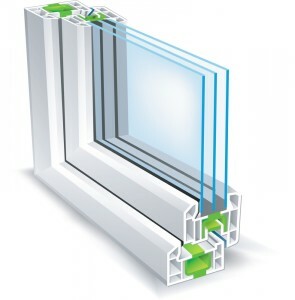 It is ideal for a window frame to expand and contract at the same rate as glass. It boasts durability as a structural material that can maintain strength in any clime. Frames can be slim in casements and awning types allowing larger glass area. They are 3x stronger than aluminum and 9 times stronger than vinyl. It will not warp, rot or discolor like wood frames under high humidity conditions and will not crack, sag, embrittle or shrink like vinyl when not painted in dark colors. About the only disadvantage of fiberglass windows is its premium pricing that puts its 10% to 30% pricier than vinyl windows of the same size and type. But as critical mass with more users creates better economies of production, the price gap should close. Fiberglass windows are generally maintenance-free and will never warp, crack, or split even in humid tropic or sub tropic climes. If you like the look of natural wood on the indoor side of your windows there are fiberglass frames permanently bonded to real wood veneer of oak, cedar, hemlock, cherry, etc. Otherwise, fiberglass frames are factory-painted with custom colors at added surcharge. Spilt indoor and outdoor color is also available but it lends easily to paining yourself. Some of the noted suppliers specializing in fiberglass windows include Thermotech Fiberglass, considered one of the best in North America and carries what are considered the world’s most energy efficient windows and doors. Then there’s the Canadian Fibertec Windows and Doors Manufacturing, Inc., and the Integrity from Marvin brand noted for its Ultrex poltruded fiberglass windows. Non-specialist brands that carry wood, vinyl and aluminum window along with fiberglass is the half-century old Milgard which was among the first to produce fiberglass windows in the industry.